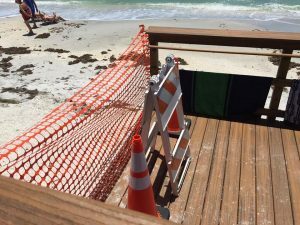 The Boca Grande 5th Street Beach Access is closed indefinitely due to erosion stemming from recent storms and high tides. The parking lot will remain open. Other Lee County beach accesses on Boca Grande include 9th Street, 10th Street, 11th Street, 13th Street, 14th Street, 17th Street, and 19th Street. These locations have limited parking and do not have restroom facilities. For more information about Lee County, visit www.leeparks.org. Newer PostIs there any way to stop the pirate-ization of Boca Grande?